Hallelujah! This dish was a VERY surprising hit. I'm not sure why I was so surprised, maybe because I'm not big on fresh mint in my food, but it only served as a subtle background element. There are so many overwhelming (in a good way) flavors in this recipe, and so many odd ingredient combinations: I literally smiled after my first bite. Probably because I was expecting to be revolted; au contraire, this is an amazing and hearty dish that actually makes you look forward to the leftovers. Let's start off with the crazy opposites in this recipe. 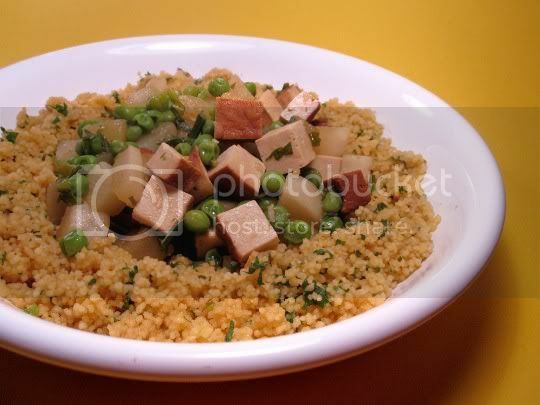 Turnips (a winter root vegetable) are combined with peas (a springtime legume), green onions, baked tofu (Italian flavored is suggested, I used "savory"), cumin (generally used in Middle Eastern, Latin, or Indian cooking), and fresh mint. The couscous is Parmesan-flavored and mixed with vegetable broth, fresh parsley, and olive oil. Can we say, multicultural? Although the recipe says this is a "North African-inspired stew," I think perhaps one of the reasons this dish is so good is that it takes a little bit of some of the best flavors from every cuisine. The couscous is cheesy, salty, and nutty, which is emphasized with the addition of the herbal parsley notes and the savory vegetable broth. It serves as a delectable base for the turnip and pea "ragout," which is savory, sweet, and fresh. Believe it or not, there's almost a meaty taste imparted in the stew, and I think that's due to the tofu and the roasted and smoky cumin. Although the couscous is salty, you will need to salt and pepper the ragout to taste. Now for a meal that's supposed to take 30 minutes or less, I sure was doing a lot of prep work and chopping. I would NOT suggest making the couscous first; instead, start on your veggie prep (which will take the longest) and get that all going...THEN start the couscous. Because the kind used is Parmesan-flavored, it can get a little sticky if left sitting for too long, so it's best to serve this fresh. Also, don't overcook the stew (like I did...my turnips were starting to get a littke mushy, but they should be firm yet bite-tender). The recipe says to cook it for 10 minutes, but I'd say your best measure is to watch the color of the peas. They should still be bright green upon serving, but be careful because they will continue to dull after the heat is off. Make again? Yes. North African, Italian, Mediterranean...whatever this is supposed to be, it's GOOD. Vegan variation: Use regular couscous.